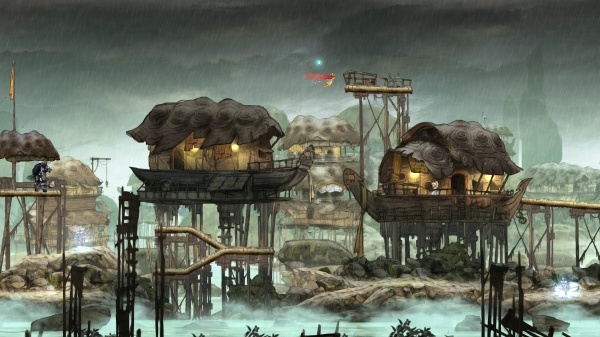 Child of Light evokes a fairy tale feel from the moment the game begins. A young princess named Aurora falls into a deep sleep and appears dead to her world, but she awakens in the magical land of Lemuria. An evil darkness is enveloping that land, and Aurora is somehow the key to Lemuria's salvation. How did Aurora come to Lemuria? And what is that world's connection to her own? These are just a few of the questions that you, as Aurora, must discover the answers to. The story's fairy tale connection is reinforced by the way that the entire story and dialog are delivered in rhyming couplets. While this occasionally leads to some awkward turns of phrase when the writers obviously struggled to force some of the narrative into rhyme, overall it gives the game a certain unique charm, a feeling that you're reading along with a beloved children's book that can still be enjoyed long after you've left your childhood behind. That book analogy can also be applied to the game's graphics style as well. Lemuria and its magical residents have the look of hand-painted, water color illustrations. The game itself is primarily a light RPG with some platform game style elements. As you make your way through, and above, Lemuria there are hidden areas and treasures to discover as well as traps and dangers to avoid. You'll also have a glowing sprite to accompany you, Igniculus, who you can go everywhere that you can't and is controlled independently with the right stick. Igniculus is useful for shaking loose the orbs that heal you and restore your mana from plants that are beyond your reach, but his ability to shine is even more useful since your way will periodically be barred by barriers that can only be removed by solving puzzles that play with shadows, colors, and light. And it's always good to have a luminous friend when making your way through a dark cave. Igniculus isn't the only companion who will join your party on your travels, but the others who do join will only be seen when you find yourself in a battle. Wandering creatures and monsters inhabit Lemuria, and should you touch one you'll be transported to the game's battle screen. Aurora, a companion, and Igniculus will face off against their foe's party in a fight that's turn-based but with a real-time twist. Each combatant has a relative reaction speed, and each action they can take requires a certain amount of time to perform. This is all tracked on a time bar on the screen which includes an icon for each character and enemy in the fight. The icons move along this bar from left to right at a speed that corresponds to each one's agility. When a character's icon reaches the action line, that character can select an action such as a spell or attack. Some actions take longer than others to perform and this is reflected in the time it takes for the character icon to move between the action line and the end of the bar. Once the icon reaches the end of the bar, the action is performed, and the icon is returned to the beginning of the bar. Igniculus is there to help as well, and you can maneuver him over an enemy and then put his shine on them, which dramatically slows that enemy's icon's speed along the action bar. He can also use his powers to heal you or an ally, and since you can control him completely independently of the action bar this can often be a lifesaver. This battle system is simple to understand, but not so simple to master. You need to carefully select each action to ensure that you can complete it before an enemy has the chance to interrupt your action (or worse). It adds a deeper layer of strategy (and tension) than you get from your typical turn-based RPG. Victories in battle award you and your companions with experience. With leveling up come stat increases as well as skill points that can be used to unlock new or more powerful actions. Each character's skill tree has several branches that roughly correspond to some degree of specialization. Although there aren't classes per se in the game, you can certainly focus a character's skills towards different roles such as support, healing, or melee. Magical crystals known as Oculi can help further specialization as they provide special buffs to weapons and armor that can be aligned to each character's strengths. 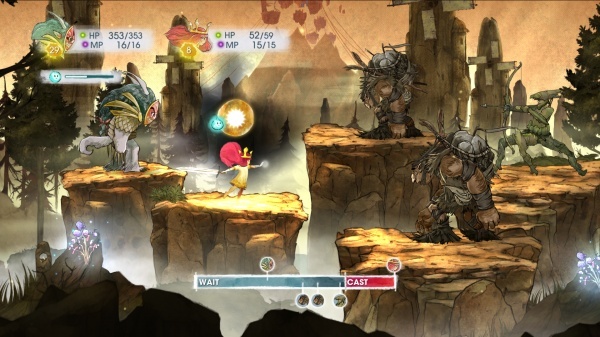 In spite of all of its charm and innovation, I can't really say that Child of Light will appeal to those who have never really enjoyed turn-based RPGs. However, if you don't count yourself among those gamers, then the game is certainly worth your time. Its unique look and charms will stick with you long after you've finished the game, and long after you've forgotten most of the other RPGs that you played before it. Final Rating: 88%. As much a fairy tale as it is an RPG.